Overproof, Imperial Strength- if the Rum is over 49% ABV, you'll find it here. Overproof rum definitely brings out the sailor in most of us. 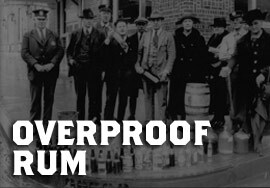 Overproof rum allows you to get the truest sense of the spirit and gives you the flexibility to add water (or not) to bring your spirit to a desired proof.